While Isle au Haut does not have a plethora of mountain peaks to explore, Duck Harbor Mountain is the notable standout. 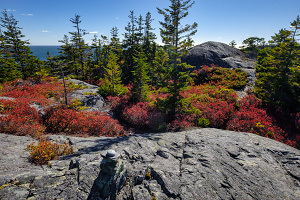 Starting just south of the Duck Harbor boat landing and campground, the Duck Harbor Mountain Trail climbs above the forest canopy to wander up and around the exposed granite formations and ridgelines to reach the summit as well as several other little viewpoints, offering views of Duck Harbor to the north and Western Head to the south. A few scrambling obstacles on the south side of the summit add to the difficulty. The trail ends at the junction with the Goat Trail at Squeaker Cove where hikers can continue hiking along the inspiring coast. South of the summit, the trail actually gets a bit more difficult as it continues meandering from highpoint to highpoint. There are a few spots that may challenge some with a bit of scrambling to get up or down a boulder formation; you will need to use your hands in at least two spots. 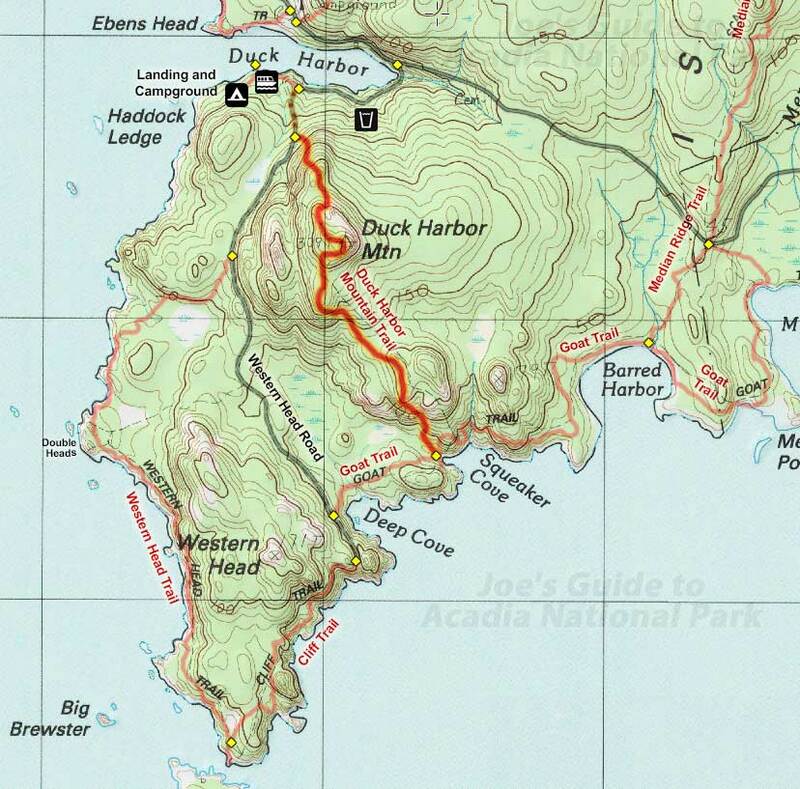 As the Duck Harbor Mountain Trail gets closer to the ocean, it will eventually descend into a lush forest and end at the intersection with the Goat Trail at Squeaker Cove. From this point, depending on how much time and energy you have, you can explore the coastal trails in either direction or enjoy relaxing at one of the coves before walking the Western Head Road back to Duck Harbor. 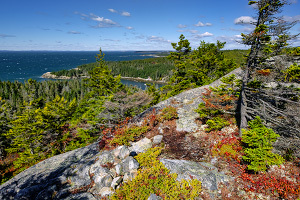 In addition to the popular must-do oceanside trails, the Duck Harbor Mountain Trail is also time well spent on Isle au Haut. If you have the time and energy, use this trail on the way to or from the Goat Trail instead of walking the not-so-exciting Western Head Road. While the views may not be as stunning as some of the peaks on Mount Desert Island, it is still a great route with its share of vertical challenges.